When it comes to Finland, I remember my friend Mr. Aho. He was the President when USSR dissolution took place in 1991 and the country was in its worst condition. In the springtime this year, I received a sudden unexpected phone call from him saying that he wanted me to participate in the annual conference of SITRA where he is acting as President. I accepted the invitation with pleasure. He is one of the leaders in the world, whom I have seen also at a conference at St. Petersburg in June. I came to Helsinki this time for the SITRA conference. 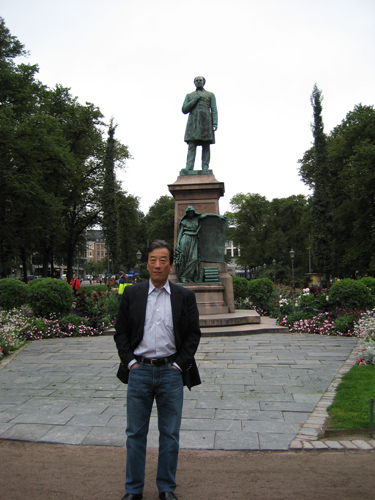 My visit to Helsinki is after more than 10 years, since the conference of International Union of Physiological Sciences. 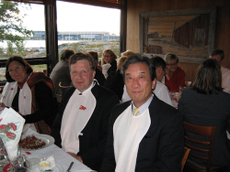 At that time, Mr. Miyagawa was the ambassador of Finland and Mr. Matsuda was the ambassador of Denmark. I remember this because I have visited them after receiving their invitation. When I was working at UCLA, both of them were Consulate Generals of Los Angeles so I was quite acquainted with them. Helsinki is a beautiful calm town. There are big rocks around here. 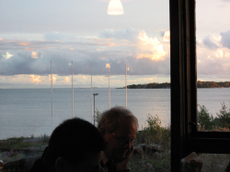 The population of Helsinki inner city is 5, 00,000 and one million including suburb. In the evening of the day I arrived, His Excellency Ambassador Honda invited me for a dinner with first secretary Mr. Sakamoto at his residence. Next day I visited the University of Art and Design Helsinki and The Theatre Academy (photo3), where subjects such as art, design, drama are being taught, with Mr. Teppo Turkki (photo2) . Mr. Turkki has come to Tokyo in June with his family (his wife and two children. Mrs. Turkki is a professional ballet dancer and she seems to be busy in creative dance show along with her studies in the ethnic backgrounds) for one month to participate in the workshop of "Global Innovation Ecosystem" that was introduced in the Blog of June 29. The people in Finland are fond of activities such as design, drama and it seems to be a very important part of their life. They are very popular. I am told that tuition fees are exempted in the colleges, even for the International students. Isn’t it a nice environment? There are students from Japan, China, and South Korea also. Mr. Turkki posts several reports on his visit to Japan to SITRA Website. Unfortunately, the current reports are still in Finnish, so I cannot read it. I have requested to convert them into English so that I can read them. He also wrote a book about Japanese culture such as latest magazine “Cool” but this is in Finnish, too. In the late afternoon, we had a discussion about the next day’s conference. It’s theme this time is “Issues with Asia: India, China, Japan” and speakers are Dr. Ramasami (Secretary to the Government, Department of Science and Technology), Dr. Jun Yu（Beijing Genomics Institute, Chinese Academy of Sciences）and myself. In the evening, we had a very delightful dinner watching the sunset at a restaurant on an island that was at the distance of approximately 5 minutes by ship. 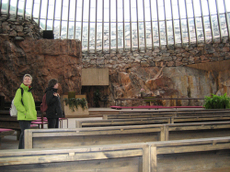 (Photo 4 – 6). Boiled "Crayfish" which was approximate 10 centimeters in size were served, Mr. Aho taught me the way to handle it and so I was able to eat 8 of them by “cutting it into pieces”. Dr. Erkki Ormala (Vice President of Technology Policy) of Nokia was also with us. In the business world of cell phones, Nokia holds 38% of the share while Motorola 14%, Samsung 13% and Sony-Ericson 11% respectively, and Japanese manufacturers having just one digit share even if 10 companies are combined. In addition, calling rate is the highest in Japan. Can you see where the problem is? Really one should think about it. 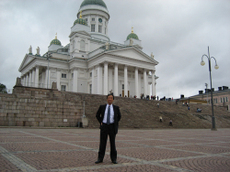 Next day in the morning, I was taken to sightseeing in Helsinki (Photo7 -10). At the conference that started in the afternoon, I talked for 30 minutes first and then heard lectures of other two persons. Due to the departure time of my airplane, I was not able to hear the next panel and I went to the airport for my return journey. I think that everyone enjoyed my lecture. Contents of the meeting can be seen on the website of SITRA. It is already posted on the web cast, isn’t it fast? Here, you can feel the impact of information era. Whether you use it or not determines your success. This is my message to you. Next morning I arrived at Haneda via Kansai airport and in the afternoon, participated in the hearing of "World Premier International Research Center (WPI) Initiative" organized by Ministry of Education, Culture, Sports, Science and Technology. In the evening, there was a dinner at the German embassy with Ms. Merkel who was visiting Japan. The hearing of WPI will continue tomorrow. I left New Delhi in the evening of August 9 and arrived at Singapore in the morning of August 10. My visit here is since April, to participate in the Board of directors meeting of A*STAR (Also introduced in the posting of April) known as Center of science and technology of Singapore which is held three times a year. The day I arrived Singapore from India happened to be the day for commemoration of founding of the Nation. There was a grand celebration and spectacular show in the evening. It was telecasted live on the television; I could see a part of the celebration from the hotel also. The next day was board of directors meeting of A*STAR , whose members were all internationally active leaders and discussions were heated . Everyone was filled with enthusiasm to bring up, select, and make globally competent leaders out of young, wonderful talents. Constructive ideas were exchanged openly, which is just not a common practice in Japan. The meeting is very constructive and stimulating, the progress status and evaluation of various programs are discussed openly as the country intends to implement excellent proposals as much as possible. In short, it is a wonderful board meeting. Of course, the data handouts are arranged by the secretariat, but I sense a strong determination and ability of the government to promote things based on the discussion of board of directors. Very different from some other country. 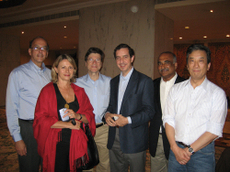 I met Dr. Yamada of Gates foundation who was in Tokyo with me (I have introduced in the postings of April 20 and August 16) , and for the first time saw Ms. Padmasree Warrior (a person from India, graduated from that famous IIT), CTO of Motorola. Mr. Rajat Gupta of Global Fund whom I wrote about the other day, was also an IIT graduate, so there was a lively conversation. Anyway, no matter in what country, such discussions on how to attract young talents and prepare fields for them to perform have unexplainable dynamic charms. Naturally, I was involved in it with enthusiasm. I arrived at Narita in the morning of August 11. In my last column, I have reported about the Gates foundation and Dr. Yamada. On the next day, on 5th, I left for New Delhi. This visit is with Professor Jeffrey Sachs, whom I have introduced in March, to participate in the meeting to be held for 2 days on the 6th and 7thas the members of the International Council for the Minister of Health and Welfare of India. The main purpose of the meeting is to listen and exchange opinions about healthcare administration of rural area (Rural Health). Program and members on the panel are as per “Agenda and Meeting Presentations” of MV Project site, but Mr.Banno, my office staff (Photograph 1) has also participated. He is scheduled to enroll in the Master course of School of Public Health, Harvard University this September. He was very happy to have this opportunity to meet top people in the world in respective fields just before going to graduate school. Dr.Sachs is Director of “The Earth Institute of Columbia University”. I hear that his latest book will be published soon. I am amazed by his effort. And what a great energy! In the council, I met Mrs. Sachs after a long time (Photograph 2: As I had informed in my blog of March 13, Dr. Paul Ehrlich, winner of Nobel Prize in Medicine is her grand-uncle. A pupil of Dr. Ehrlich, Sahachirou Hata, has discovered the first artificial compound “salvarsan” that is effective in the infectious disease (Spirochete).). 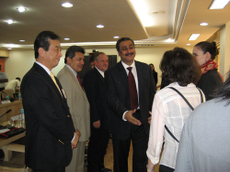 I also met Dr. Jaime Sepulveda, (Photograph 3: Introduced in, “ From Nairobi- Knowing a great leader” (June 30, 2006) He is a brain of healthcare policy of Mexico along with Julio Frenk, the former Health and Welfare Minister. 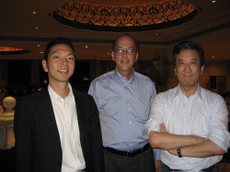 ), whom I saw last year in Beijing at the time of the presentation of DCPP 2nd edition (“Healthcare Policy of the World” (2006/4/2)) which he supervised with Dean Jamison. By the way, I hear that Dr. Sepulveda is moving to Gates foundation from August. Anyhow, they are trying their best to overcome such poverty that cannot even have access to sufficient power supply. It seems that “ASHA” program to support the activities of women in the villages, which was planned by Dr. Mirai Chatterjee, Commissioner of WHO etc., has achieved great success. Dr. Chatterjee is my colleague in the commision. Next day, I had discussion with Dr. Ramadoss, Health and Welfare Minister for about 5 hours in the morning. 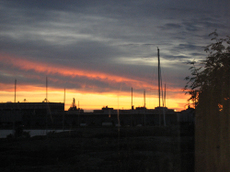 I was impressed, as he was aware of each detail (Photograph 4, 5). It was obvious as he is a physician specializing in sanitation of rural community. He assumed the post of Health and Welfare Minister just at the age of 37 (years). This is his 3rd year as a Minister. Since the budget may go on increasing as the economic grows, the task is huge and difficult, but I think it will move in the correct direction even though time is required. In the meanwhile, it is said that in 8 states out of 32 states in India (may be more in area) the water contains large quantity of fluorine resulting to millions of intoxicated persons. Moreover, the arsenic poisoning from water is very large in three states, and this is truely miserable. When speaking of arsenic it reminds me of the intoxication in Bangladesh, for the same cause. I left for Singapore by night flight on 9th . As regards to Dr. Kanichi Asakawa, I have introduced his masterpiece “Omen of disaster in Japan (orijinal title "Nihon no Kaki". Published in Japanese only)” in a book review titled “requirements for a leader: historical percpectives, view of the world and vision” together with “The taming of the Samurai” by Eiko Ikegami and “Embracing defeat” by Dr. John W. Dower of MIT. This was the first time I wrote about Dr. Asakawa, but ever since then, I have been repeatedly writing about him in my site, so please “search” them. He is truly an admirable person, the first Japanese to become a professor at an American university, a historian at Yale. 2005 was the 100th year since the end of Japanese- Russo War and the conclusion of Treaty of Portsmouth so there were a lot of articles about Dr. Asakawa in Japan. Please look up Dr. Asakawa’s books in Amazon and search on Google and Yahoo! for more information about him. The other day, I wrote about a symposium on Dr. Asakawa held at Yale University this year but I also found Dr. Yabuki’s lecture on Dr. Asakawa, from an academic perspective, being introduced in Gakushikai’s newsletter. In 1904, 5 years before Dr. Asakawa wrote “Omen of disaster in Japan”, in the midst of a conflict between Japan and Russia, he claimed Japan’s legitimacy in a paper titled “Russo- Japan Conflict” (I think it was written in English). I remember reading it in the blog site of Dr. Yabuki at Yokohama City University. Why Dr. Asakawa again? I think it is because the situation of Japan has essentially not changed at all after 100 years and in a sense, the circumstances surrounding Japan is somewhat similar. Even in such a global era, I feel that there is no strong leaders or scholars like Dr.Asakawa in those days as described in “The man who fought against ‘arrogant Japan’ ? behind the scenes of Treaty of Portsmouth” by Miwa Shimizu and “The last ‘Japanese’ – life of Kan’ichi Asakawa”by Yoshio Abe (both in Japanese only). Now is just the time that scholars should speak out from a higher standpoint to the power, government, and to the people . I understand well that someone like Dr.Asakawa is rare. But universities nowadays say in every occation that they should earn money and only talk about money when it comes to researcher’s “incentives”. The world is not only greedy people. What kind of a person would want to be a teacher in such greedy place? Don’t you think that it’s nonsense to say that anything “can be measured by money”? Children become lively only when everybody supports the school and the teachers. This is the essenctial of education. Basically the same things have been said and written repeatedly for 20 years about this “theme on Asakawa”, so please think about it. Dr. Ito’s article in the Gakushikai’s newsletter is also referring to a primordial issue that has been unrecognized in the Japanese society saying that the deviation education for university entrance exams were thought to be working well but it is obviously time to change in this global era of which Japan is a part of it. 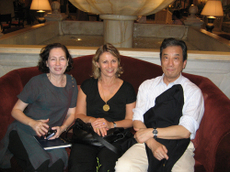 Gates Foundation, Dr. Tachi Yamada and support to Africa! I’m sure you are all familiar with the Gates Foundation (Bill and Melinda Gates Foundation). Gates, the richest man in the world, took a big step forward and established an enormous foundation (4-5 trillion yen) to eradicate AIDS, malaria and poverty in the world. This program is called the Global Health Program and last year, and it caused a big sensation when the second richest man in the world, Warren Buffet donated a tremendous amount (3-4 trillion yen) to this foundation. Gates will retire from Microsoft next year to concentrate his focus on this activity. 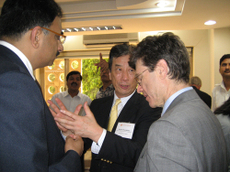 The first President of Global Health Program was Dr. Richard Klausner of NIH National Cancer Institute, but last year my old friend Dr. Tachi Yamada assumed office. Tachi and I have been friends for 30 years, ever since he came to UCLA in 1977, I helped him develop human resources in the gastroenterological area in Japan. 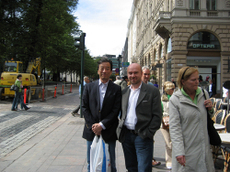 A few years ago, I introduced him in a column in the Nikkei Newspaper. In 1984, the year after I returned to Japan from UCLA, he became a professor of University of Michigan and later became the Chairman of Department of Internal Medicine then turning to the Chairman of R&D of GSK, the world’s second largest pharmaceutical company after its merger. He became the President of Global Health Program of Gates Foundation last June. I met him in Singapore this April. This time, we invited him to have a session on how Japan can cooperate to support Africa. As I have written on several occasions in my blog, Japan has indeed done a lot of contribution to Africa. It’s their PR strategy that isn’t good. On the following day, I had lunch with Tachi and asked my friend Ken Shibusawa to join. At night, after so long, I had dinner with my wife, Tachi and our granddaughter whom Tachi met for the first time. We went to a traditional soba (buckwheat noodle) restaurant in Shiroganedai. In the past 25 years, our relationship was more business related, so it’s been a while since I had a pure private dinner with him and enjoyed every moment of it. He said he spends half of his year overseas. Africa, India, all over the world. As for me, it counts for about 25-30%. We said to each other that we are both busy persons. Tachi stayed for another 3-days and heard that he met with a lot of key people. I left for India from the 5th. I participated in Karuizawa Top Management Seminar which was held on July 13 in Karuizawa. Professor Reona Ezaki, myself and Professor Tasaka Hiroshi were the 3 members of the Panel and the topic was "Innovation and Human Power". Tasaka Hiroshi who was hosting the seminar is professor at Tama University and is managing Sophia Bank along with Ms Kumi Fujisawa. The report summary will be published on the site in the near future. 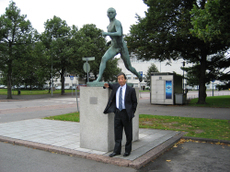 Dr. Ezaki is a very well-known personality and Dr. Tasaka who is an extrovert person with good social interaction has written number of books which are posted on his site and multiple blogs (both links are in Japanese). I asked him to come to the hearing of “Innovation 25 conference" to express his views. He is also supporting the Social Entrepreneur Activity through the activity called ‘Sophia Bank’ with Ms. Kumi Fujisawa. Isn’t it wonderful! Our interim report of “Innovation 25” also indicates the importance of these "Social Entrepreneurs". There was a series on this reported in Nikkei a while ago, too. 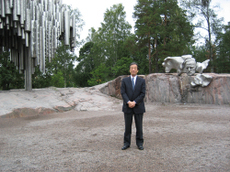 On the same day the honor lecture was delivered by Dr, Makoto Iokibe , former Professor of Political Science of Kobe University who was inaugurated last year to the President of National Defense Academy of Japan . He is a famous personality whose information is available on Wikipedia as well. When I was President of the Science Council of Japan, he helped me a lot as a member at international conferences etc. He told us many interesting things. I heard that lectures of President are organized every month. It is wonderful that Dr. Iokibe gives lecture every month as the provost. I was especially impressed by his comparison of the strategies Japan has adopted in Asia after its victory in Russo-Japanese war 100 years ago with Kandata, a thief which appears in the famous short story of "Kumono Ito (spider’s thread)" , by Ryunosuke Akutagawa. Have you heard of RedHerring? It’s a famous media in Silicon Valley. They held a 2 day conference from July 22 to 24 in Kyoto, for the first time in Japan. Venture entrepreneurs and venture capitalists gathered. I was asked to make a speech on “Innovation” so I went to participate. You can see part of the program, speakers and panel in RedHerring Japan 2007 site. I was new to such kind of gatherings, so to get a grasp of what it was like, I took part from the first day. People like Mr. Semmoto formerly from KDDI (also met him in St.Petersburg in June) and Mr.Idei formerly from Sony (I introduced him in my blog in April “From Camarague”) were familiar to me, but to know the audience before I speak is very important, so thought that it was a good opportunity. Approximately there were about 150 participants. Half were Japanese and the rest were diverse, but all young. 70% of the Japanese were from Silicon Valley. Half of the foreigners were based in Japan and there were a lot of Koreans from Silicon Valley. Most of them were ICT related ventures and not so many bio people. Mr. Fredrick Haren from Sweden talked about “Creativity, Innovation” which was very unique and full of impacts. (Some people may say that he is an "out of box" type.) He introduced his book called “New Ideas” and later, as we got along so well, gave me the book saying he brought some with him. I seem to be compatible with queer people. Maybe because we share something like Don Qixote? Sounds odd, though. Well, since it was like that, I listened to other people’s story and changed my slides back and forth. Eventually, I used the slides at GIES2000 and part of Prof. Jorgenson’s slides that was used at the Workshop in June. These were updated slides based on Prof. Jorgenson’s latest book, 「Productivity: Information Technology And the American Growth Resurgence」（MIT Press, 2005）. This is a perfect guide to learn about the growth in the US industry and IT related companies after the IT bubble burst in 2000. For everyone in the industry, policy, university related field, please read it thoroughly. This is another example of dynamism of United States that many such books are published from universities. I closed my speech referring to Steve Jobs’ 2005 commencement speech at Stanford University. It goes like this. 2）　You’ve got to find what you love. Don’t settle. 3）　Death is Life’s change agent. To grasp the meaning of these, you have to read his speech thoroughly. Go to the link that I cited above. I think it is a wonderful message. I envy the graduates for being given the chance to listen to his live speech. By the way, Bill Gates delivered a commencement speech this year at Harvard, and this is also a very touching speech. Their words are based on their true experience, therefore convincing more than anything else. Since I closed my speech with this slide, President of RedHerring, Mr. Alex Vieux who acted as MC totally got happy and added his story after my speech. I was delighted. The participants were obviously not the Japanese businessman type that I usually see. They enjoy their work, young, energetic, outspoken, and spoke out without caring whether their English was good or bad. It was quite interesting.